One day after United Nations Secretary-General Ban Ki-moon expressed optimism about worldwide efforts to reduce greenhouse gas (GHG) emissions, a new report, “Climate Adaption: The State of Practice in U.S. Communities,” dives into how several American cities are attempting to cope with the effects of climate change and associated threats such as rising sea levels and extreme storms. The UN leader was speaking at COP22, a meeting of nations taking place in Marrakech, Morocco, that’s a follow-up to Paris’ COP21 meeting last November where an ambitious climate agreement was signed. Ratification of that 2015 accord signals the intent of more than 100 countries to reduce GHG emissions and slow climate change. According to The Guardian, Ban noted the results of the recent U.S. election and his expectations of a Donald Trump presidency. “I hope he will really hear and understand the severity and urgency of addressing climate change. As president of the United States I hope he understands this, listens and evaluates his campaign remarks,” he said. 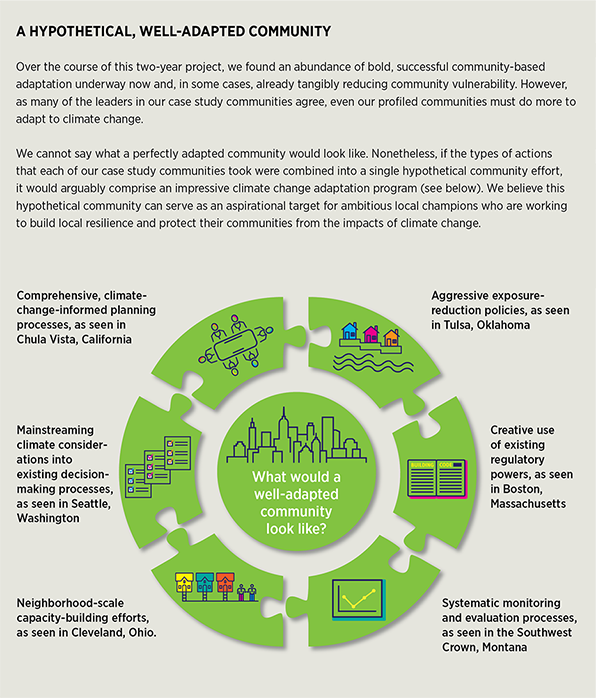 The Climate Adaptation report, funded by the Kresge Foundation and written by research firm Abt Associates, presents case studies of 17 U.S. communities, ranging from Cleveland, Ohio, to Chula Vista, California. The researchers compiled some of the most effective actions that cities can and are taking now, with resources they likely already have. They also designed a graphic of the “ideal” climate-proof city — using a composite of what various local governments are doing here and there. The model focuses on already common policy tools, such as ordinances, permits, bonds, utility fees, zoning and hazard mitigation planning. While not a perfect blueprint, it’s meant to serve as “an aspirational target for ambitious local champions” working to boost resilience. Although climate change adaption is still not a top priority for many in the U.S., the report asserts that cities are doing far more to prepare than is “conventionally believed.” Often, the efforts are aimed at some other purpose, such as improving health or community engagement, rather than recognized as efforts to adapt to climate variability. That overlap can be used to cities’ advantage. “Climate adaptation actions that also address longstanding problematic conditions — for example, decaying infrastructure or weakened ecosystems — can help win important allies, enhance community support and facilitate progress,” the report states. See the full report here, or breakdowns of what each of the 17 cities is doing here.